Living a healthy lifestyle involves more than just eating organic produce once in a while or trying a cleansing diet for a month. These are both good ways to get started on a road to health, but healthy living really involves more than just food. It involves everything we breath, everything that touches our skin, everything that we clean with, and what is off-gassing in our house. When we look at cleaning up our personal care products, we really need to look at everything that comes in contact with our skin. A good motto that has often been used is: “If you can’t eat it, don’t put it on your skin”. Our skin is our body’s largest organ, and it is covered with more than 4 million pores. When we eat food, our digestive system helps to remove some of the toxins and harmful microbes that can be found in it. When we put things on our skin, they instantly are absorbed and go directly to our blood stream. Toxins are now in our body without any kind of “pre-filtering”. Look at any bottle of shampoo and lotion on the market and you’ll find they have literally DOZENS of ingredients, many of which are harmful to your brain, cancer causing or just generally toxic. Colors, preservatives, thickening agents … all have known risks. Making your own products is quick, cheaper and much healthier. I will be including several recipes over the next several weeks for products such as shampoo, skin care products and ways to clean your home without introducing any harmful chemicals. I hope you enjoy these recipes! I have also included on my “Healthy Home” page several organic products that you can buy which are less harmful than most on the market. This will help some of you as you make the transition to making your own products. This sugar scrub smells delicious! You can easily substitute your favorite blend of essential oils as desired. This recipe was one I found on the “Prairie Homestead” website. This scrub is great in the winter when you have dry skin; it also makes a nice gift. It gently exfoliates, the cooling sensation of the peppermint soothes itchiness, and the oil moisturizes. 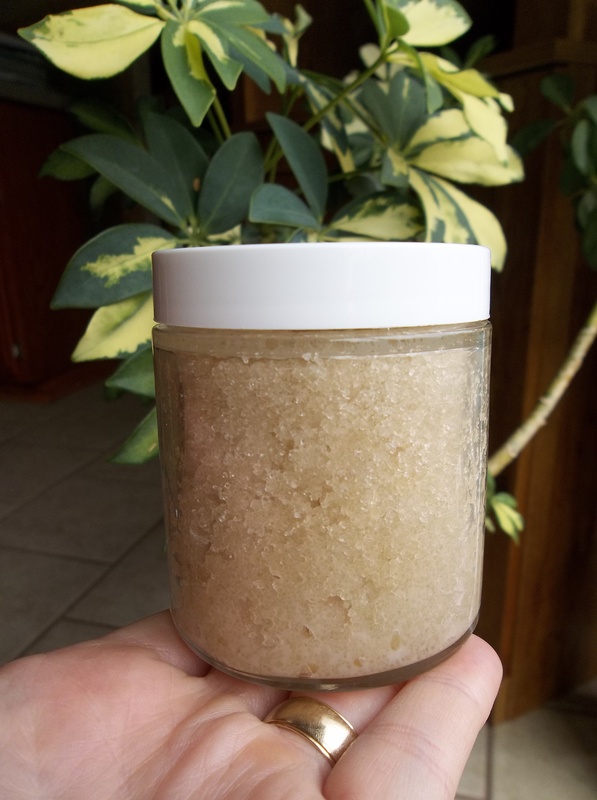 I never spent much time on my skin before (I have very few beauty products at all in my bathroom, even before changing to a healthier lifestyle), but this sugar scrub feels great on the skin and is wonderful for softening calloused heels and feet. Mix all the ingredients together, slowly adding in the essential oils until the desired scent is achieved. You are looking for enough oil to make the sugar stick together without oil floating on the top. I tend to use more oil than the recipe states, but slowly add oil in (or add more sugar as needed). Place sugar scrub in a small glass jar like the one pictured. Rub a small amount on your hands or body and rinse off with warm water. Looking forward to more recipes, thank you! We’re Zion Health a vegan body care company based in San Francisco. Since 2007, we’ve offered a line of all natural skin and hair products that feature a unique detoxifying clay. If you’re interested, contact me at cheyenne@zionhealth.com with your mailing address, and I can ship out a sample ASAP. Thanks, and hope to hear back from you!